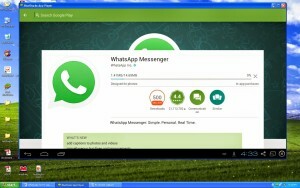 Using blue stack for WhatsApp PC works as on 2015/ October. But it can de authorize your mobile phone. for authorizing your you can select call instead of Sending detecting SMS by whatsspp itslef. So you can use only at Desktop with that phone number. Whatssweb evert time we have to scan QR code. After closing the window you have to re authorize the WhatsApp account. 1. Enable WIFI / Data On mobile Phone. 2. open https://web.whatsapp.com/ on laptop/desktop. 4. 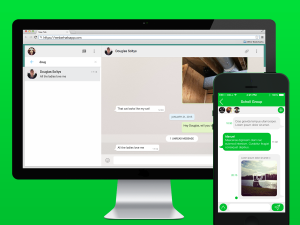 Select WhatsApp web and click on + Button. Scan QR code On Laptop Screen. then it will connect Automatically. 5. don’t Turn off Mobile Internet. if you do you lose connection on the desktop too. For Scanning QR code you need to enable WiFi or mobile data on your Mobile. Onlock screen, on status bar and top remider. But face book running background. when enable the data /wifi Fb sends Push Notifications and visible online even if not using FB app on Android phone.